Alex Corones is the Queensland General Manager of ISIS, which has been transforming property for 25 years with its extensive offering of fitout and refurbishment services. ISIS takes an integrated approach to property renewal, helping clients in any area that can add value to their property, from construction of a new building to the ongoing development of that property. ISIS has a staff of over 300 people in offices around Australia, and it continues to grow. I started out as an urban planner. I studied urban planning and worked as a consultant for a development firm and I played around in that sphere for the first 10 years of my career. I did that both here and in the US. Mid-2010 I was given an opportunity to join ISIS in a business development role and over the next few years I took on more and more responsibility. Just over a year ago I was fortunate enough to be promoted to Queensland General Manager. I ask the stupid questions - the why’s and the why not’s - because I don’t have a lot of those preconceived ideas and a lot of that embedded knowledge that a lot of the other guys do. ISIS celebrates 25 years next month - what's the journey been like? We have grown exponentially in that time. We started as a commercial office fitout company, we still are, but we also operate in hotel, retail, education and health care. I think the key to our success is that we’ve stuck to our core values. We haven’t strayed out of our fitout and refurbishment space, that’s been the core goal. We have added on key build capabilities to the business but it’s a small component for a very select group of clients. We’ve always stayed true to what we started out as. I’d have to say that, most recently, it’s two projects we have received recognition for which were the state-of-the-art lecture halls we delivered for University of Queensland, and the high-end retail grocery concept that we did for the Standard Market at Newstead. How does ISIS approach the cost? It’s a really honest approach. Price, capability, previous experience and having a team that works together all comes into it. Sometimes you have to take a targeted approach but the ideal scenario is when you don’t necessarily have to cut your pricing to the bone but you can augment that to a strong knowledge capability within the team you’re offering. What’s your take on the future of work spaces? The future of work spaces is technology - but, more broadly, I think innovative workplace design. People are expecting things that are more revolutionary than what has been delivered before. 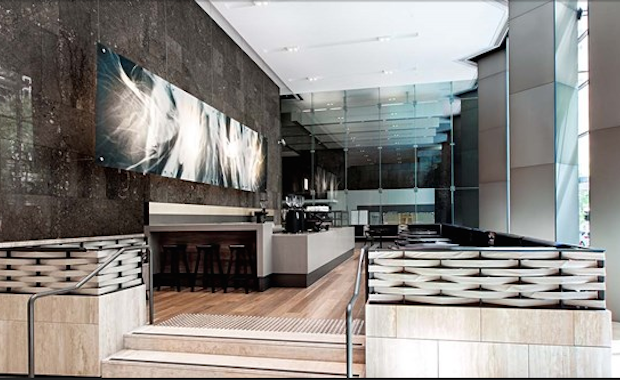 There are excellent, world class, commercial office fitouts in Brisbane and Australia. There’s been a lot of hype about Activity Based Working (ABW) and what that is going to do in terms of efficiencies. Innovation will continue and they’re the areas we will see much more growth in. I think technology has done two things: firstly, it has allowed the workforce to become more flexible, allowing businesses to rationalise space. Secondly, it becomes a very business-specific proposition - you can’t rely on a one size fits all solution or technological innovation for all businesses because it won’t suit. What does ISIS do to understand the role of a business for its fit-out? It’s all about communication - sitting down with the client and having a good and honest conversation about what they need. There are a lot of different elements and variables to take into consideration, but always the most important thing is to understand what the client wants the most. What’s a really interesting trend that you are seeing in the hotel market? I think we’ll see Brisbane become a really cool space, in terms of the hotel market. In the last three years you saw the end of the refurbishment cycle here so the next one probably is still about five years away until it kicks off again. Asian business travellers and wealthy tourists are certainly used to a different kind of product and I think it will influence development in Brisbane. In Asia you have a lower cost of labour and tools so those buildings can be more opulent. But here in Australia, CBD land is constrained, it’s very difficult to get a hotel project up and running. How are you driving positive culture within ISIS? We are taking the view that we do provide a great place to work for our staff. We have great offices, we have made an investment across the country in that. This is what we do, we build stuff inside things, so we want to have a great office to show people. That culture translates externally in that if you have people that are happy to work, naturally they’ll be calmer and more considerate. I’m reading Good to Great by Jim Collins. Pablo down on Brunswick Street in New Farm. I like to go for a run without an iPod. I have a soft spot for the States but I’m planning a trip to Japan next year.